"The Holy Spirit does not awaken and strengthen faith apart from the Word of God. 'Faith comes from hearing, and hearing through the word of Christ' (Romans 10:17)." How foolish and lazy I have been, neglecting the Word, expecting God to snap His fingers and make it so while failing to walk up to the table and feast on the Bread of Life so easily available to me. I pray that God will increase my hunger for His Word, and open my eyes to see wonderful things in it (Psalm 119:18)--and in so doing, that He would strengthen my faith. "I have the profound sense that many people who complain of not being able to rejoice in God treat the knowledge of God as something that ought to be easy to get. They are passive. They expect spiritual things to happen to them from out of nowhere. They don't grasp the pattern of the Bible expressed in Proverbs 2:1-6. "My son, if you receive my words and treasure up my commandments with you, making your ear attentive to wisdom and inclining your heart to understanding; yes, if you call out for insight and raise your voice for understanding, if you seek it like silver and search for it as for hidden treasures, then you will understand the fear of the LORD and find the knowledge of God. For the LORD gives wisdom; from his mouth come knowledge and understanding"
"Look at all those aggressive words: 'receive...treasure up...make your ear attentive...incline your heart...call out...raise your voice...seek...search'--if you do these, then the knowledge of God will be yours. Not because you can make it happen. The giving of the knowledge is still in the hands of God: 'For the LORD gives wisdom.' No, the pursuit of the knowledge of God is not because you can make it happen, but because God freely chooses to bless seeking with finding." He's almost ready to drywall the nursery and guest bedroom upstairs, but the big delay has been the heating/air conditioning. We really don't think warmth in the winter will be an issue, but those rooms will definitely need summertime A/C. And when Steve went to run the ductwork a few weekends ago, he discovered, essentially, "you can't get there from here." We weren't sure what we were going to do, because I wanted to avoid window units if at all possible. Those rooms only have one small window each and I hated to block the natural light with an A/C unit! But leave it to Steve, he found a way! On Saturday, he cut holes to run the ductwork up through the linens cupboard in the bathroom. This will be slightly inconvenient for a while, as it pretty much eliminates the very limited storage I did have in the bathroom, but we already have a makeshift "linen closet" in the hallway anyway, so it's not that big a deal. And once the downstairs bathroom gets gutted and remodeled (which, realistically, won't happen for at LEAST another year I am guessing, but it will eventually happen), we'll be able to have a real linen closet. Until then, I can deal, if it means A/C upstairs! Amy is lying on the couch, browsing through the Stampin' Up catalog a friend dangerously gave her last night. Steve enters the room. Amy: (laughing) Well, yes...but more over paper and ink and ribbon. Steve: OH...because that makes SO much more sense than lusting after stamps. Amy: I can't help it that I have a stationery/paper products obsession! I don't expect you to understand. I have never seen or watched Gone with the Wind. Upon hearing this, my born-and-raised-in-South-Carolina friend Kathryn was completely appalled. She fully intended to sit me down and watch this Southern epic with me the two summers we lived together, but we never got around to it. Now that I'm on restricted activity, I've got plenty of time on my hands. And now that I'm living in the South, I really should be familiar with this classic. Should I start with the book or the movie? Amy is sitting at the computer. Steve has headed upstairs to work. Amy hears loud banging and the sound of plaster raining down in the walls. Steve comes downstairs to grab a tool. Last month, I had the privilege of attending a conference put on by The Voice of the Martyrs. Speakers included VOM staff members who travel all over the world to serve the persecuted church, as well as brothers and sisters from other nations who have themselves experienced persecution. Darcie Gill explained that her role is to go to persecuted believers overseas and ask them: What do you need? How can we help you? Can you guess what is the number one thing they always ask for? It's not food, or shelter, or legal help, or even Bibles. They need prayer. More than anything, they want their brothers and sisters around the world to intercede for them. On May 15, government authorities expelled seven of 10 Christian families from their village in Laos, and transported them to another village 12 hours away. According to The Voice of the Martyrs' contacts, the authorities told the families, "If you want to continue believing in Jesus' religion, you need to leave this village and go live in a village where there are Christians." The husbands were forced into vehicles while the wives were working in the rice paddies and this has resulted in chaos. The families are separated and are having difficulties adjusting at the new village because their tools, utensils and belongings are at the old village. Pray God gives the families grace and protection as they deal with these hardships. On May 14, Reverend George Minj and Sister Teresa Kindo, were attacked in a village near Ranchi as they returned to their parish in the evening after leading prayers in a nearby village. The priest sustained a blood clot in the head and is being kept under observation. Pray for the priest's speedy recovery and for protection as they continue their ministry in the area. On May 13, more than 20 Hindu extremists attacked a worship service in the town of Kushalnagar. The extremists destroyed Bibles, and beat several believers. They told the pastors to stop converting people to Christianity. Pray for protection for Christians in India. Ask God to heal the believers that were beaten. On May 11, a mob of Muslims attacked Christians in Bahma village south of Cairo after hearing rumors that a church was to be built in the village without government permission. Muslims left their Friday prayers and attacked the homes and shops of Christians, setting the buildings on fire. At least 10 Coptic Christians were injured in the attack. People from both faiths took up sticks and hatchets and began hurling bricks and firebombs at each other. At least 27 houses and shops were damaged by fire. At last report, 59 Muslims have been arrested on charges of arson and spreading sectarian strife. Pray these Christians will be encouraged to worship together, despite opposition. Pray they will demonstrate love to their neighbors. Pray for their leaders: 1 Timothy 2:1-2 tells us that we should pray for “kings and all who are in high positions, that we may lead a peaceful and quiet life, godly and dignified in every way.” We should pray that God would ordain leaders in those nations who will allow religious freedom so that persecution will end and the church can live godly lives in peace. Pray for their deliverance: The early church was not above praying for God to release those who are persecuted. When Peter was imprisoned, the church made “earnest prayer to God” on his behalf [Acts 12:5-12]. In response to that prayer, God sent an angel to free Peter. ...The Apostle Paul sought to be free from imprisonment and requested the prayers of the church (Romans 15:30-32; 2 Corinthians 1:8-11; Philippians 1:19; 2 Thessalonians 3:1-2). ...It may be an indication of self-centeredness and a “love grown cold” when a church (or a Christian) is ignorant and prayerless in the face of persecuted Christians. Pray for their witness: In Ephesians 6:18-20, Paul requested of the church, "[pray for me], that words may be given to me in opening my mouth boldly to proclaim the mystery of the gospel, for which I am an ambassador in chains, that I may declare it boldly, as I ought to speak." We should pray that the persecuted church would be bold in their witness and that through it the world would come to believe in Christ. Again this spring, we have had some visitors of the small, winged variety. How I would love to watch baby robins hatch, like last year. However, in choosing where to build their nest, this year's birdies have really blown it. They thought inside our grill would be a perfect spot. It started happening several weeks ago--maybe different birds--but we noticed before they could make too much progress, and Steve cleared it out. Now, either the same dumb birds are back, or another family had the same dumb idea...because I am sitting here hearing a whole lot of twittering right outside the screen door, and I just caught a glimpse of a bird with nest materials in its mouth perched right underneath the grill. Also, I can see twigs/bits of grass sticking out the bottom. "If you could parent your daughters all over again, what would you do differently?” It was not a tough question. While I am aware of numerous ways I would want to be a better mom, one thing stands out far ahead of the rest. First class postage to Canada from the U.S. is 69 cents. "The LORD gives strength to his people; the LORD blesses his people with peace" (Psalm 29:11). God has been bringing it to my mind again and again ever since. In the midst of so much unknown, I am trying to cling to this promise. His strength is perfect in our weakness, and He will provide the grace we need for whatever trials we face. In Christ, I can have a deep, real, lasting peace--not a tenuous peace that comes from odds in our favor, or reassuring baby kicks, or midwife checkups, but a peace in knowing that our sovereign God holds me, this baby, and Steve in the palm of His all-powerful hand, and that He is at work for our good and His glory. I'm thankful that we were able to cancel our Chattanooga hotel reservations and return our attraction tickets without any penalties or money lost. I'm thankful that since we can't go on our trips, Steve has more weekends to work on the house. I'm thankful that my midwife encourages me to call her at home with any questions or concerns I have. I'm thankful that I was even able to get pregnant in the first place! I'm thankful that we've made it to the point where the baby's chances for survival are excellent, and that I'm scheduled to deliver at an ideal hospital for neonatal intensive care. I'm thankful that the baby hasn't been born yet and I'm not having contractions. I'm thankful that most of my maternity pants don't have buttons or zippers, so it's easier to go to the bathroom five hundred times a day (which is totally not an exaggeration now that I have to be extra careful about drinking water to prevent contractions). "You know, I feel fantastic! I've really been blessed to have an easy pregnancy so far." As of yesterday morning, life has taken a surprising and disappointing turn. I'm okay, and Baby is okay, but my third trimester is looking vastly different than I expected or hoped. I had to go in for steroid shots yesterday and today, to help the baby's lungs mature faster, and my midwife has put me on restricted activity. It's not bedrest exactly; she said that there are conflicting opinions about bedrest. Some people think it really doesn't make a difference, but her experience is that it is helpful. So she gave me a few specifics (no out of town trips, no grocery shopping/vacuuming/anything that taxes the lower back and abdomen) and told me to limit being on my feet as much as possible, but said she'd leave it up to me as far as testing the waters and seeing how I feel--I just have to monitor how activity affects my body. I also have to go to the midwife every week now so they can keep a closer eye on me. What this means: No babymoon in Chattanooga next weekend. No family vacation in DC with Steve's parents and brothers in June. No more daily walks for Hank. And a huge burden on Steve as he now deals with a full-time job, house remodeling projects, and picking up the slack with housework things I'm not supposed to be doing anymore. 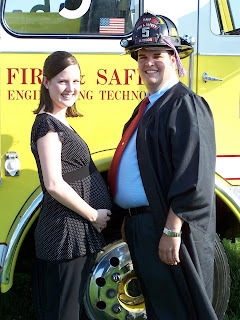 The crazy thing: After all this drama, I could end up going past my due date. You just never know. The good news: I'm not dilated at all, my water hasn't broken, and the baby isn't down in my pelvis putting pressure on my cervix. My state of mind: Yesterday afternoon, I felt silly being so lazy, because I'm not having contractions and I felt fine. But of course I also don't want to overdo it and end up going into labor, when if I had just rested more I could have prevented that longer. Last night, I was feeling tight again and a little crampy, and it scared me. I realized it's much better to err on the side of caution than to push it unnecessarily. Yesterday morning was marked by a wonderful surprise: coffee with Heather Lang, whom I hadn't seen in over six years. Heather and I were freshmen at IWU together, but she had to leave school due to some health problems. We've kept in touch over the years, and thanks to the wonders of blogging, she was able to get in touch with me to say she was coming to Nashville this week. As it happened, I had a midwife appointment downtown yesterday just minutes from where she was staying--so she met me at Starbucks and we spent a couple of hours catching up. And fourth, because it was I who was robbed, not I who robbed." When did my baby brother get so grown up? It seems like just yesterday I was beating this kid up (can you believe I actually used to be able to do that?). 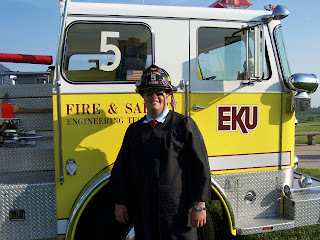 The fire & safety department at EKU has a cool tradition where, after the students get their diplomas, they replace their mortarboards with their fire helmets. Made him easy to pick out of the crowd! After the two-and-a-half-hour ceremony (made more bearable thanks to my amazing dad, who went hours early to save us seats with backs instead of a spot in the bleachers), we took some photos and then my parents treated us to a really nice celebratory dinner. Gather your family and go visit a junkyard or a dump. Look at all the piles of "treasures" that were formerly Christmas and birthday presents. Point out things that people worked long hours to buy and paid hundreds of dollars for, that...marriages broke up over. Look at the remnants of gadgets and furnishings that now lie useless after their brief life span. Remind yourself that most of what you own will one day end up in a junkyard like this. And even if it survives on earth for a while, you won't. When you examine the junkyard, ask yourself this question, "When all that I ever owned lies abandoned, broken, useless and forgotten, what will I have done with my life that will last for eternity?" So my beloved college roommate, Stephanie, came to visit me over her spring break a few weeks ago, and I never even posted about it. We didn't get any good photos of the two of us while she was here! Well, it was a decent picture of her, but I hadn't even showered yet and wasn't about to post that lovely photo on my own blog :) But she came to my shower and we got a good picture, so now I'm finally giving her a blog post. I had a blast catching up with Stephanie while she was here. I took her to Qdoba and then we had a crazy adventure at 100 Oaks Mall, which I didn't realize was completely dead. It was kind of creepy! Later that afternoon, the rain cleared off and we traipsed around Centennial Park, pretending to be photographers. It is always a blessing to see old friends, especially when they are willing to make the effort to drive several hours to come and see you! Is my favicon showing up as this weird, ugly, yellow and green hiker, instead of the normal orange and white Blogger B, to anyone else? What the heck? UPDATE, 3 PM: Now it's back to normal. Weird. UPDATE, 3:20 PM: ...And now it's the ugly icon again. What is going on?! What kind of nutjob saves a printed email with driving directions to someplace she visited in November 2005 but hasn't been since? Me, that's who. Saved my brother from having to type them out again, anyway. And how sick is it that I was able to find the directions in under 60 seconds? Baby weighs about two pounds at this point. I believe he or she has taken up kickboxing as of last week. All the movement isn't uncomfortable, though, at least not yet--I'm delighting in every little jab and wiggle, amazed (and still finding it hard to believe) that there is a baby growing inside! I just wish I could see what's going on in there! Bending over has gotten difficult, but otherwise I feel fantastic. I have been so blessed to have an easy pregnancy so far--I realize this and am not taking it for granted. And it is FLYING by! If April Showers Bring May Flowers, What Do May Showers Bring? Answer: Onesies, blankets, books and burpcloths! In other words, many blessings for me, Steve, and Baby Kannel. Jill: Can you believe I'm having a baby? Julie: Guess what? I'm pregnant too! Amy: Guess what? So am I! The ladies of my mom's family: Mom, me, Grandma June and Aunt Judy. Found out in March that all of these women had quick and easy labors & deliveries, with eight kids between them--I am hopeful! Generally, if you can pierce your cast-iron drain pipe with the edge of a putty knife, that's a bad thing. However, on the bright side, it does give you blog material. the members of my church sponsoring ALL TEN of the children whose packets Compassion International sent to me--I even had to request one additional packet! I think part of godly femininity is rejoicing in the fact that God made you a woman. But I have to admit, there is one area of life in which I cannot thank Him for making me female: Hair. I generally like my hair itself--it's thick and soft, straight not frizzy, doesn't need to be colored. But I generally hate my hairstyle. In fact, I'm not sure I can remember a single time when I left the hair salon feeling really confident about my haircut. No, I take that back. One time: I really liked the haircut I got right before I graduated from college. A friend cut it in her dorm room, for free. This morning I got a new haircut, and was reminded of this issue in which I hate being a girl. I've been through this before: Guys have it easy. Girls, on the other hand--we have no idea what we might look like when the stylist hands us that mirror. And even if we really like it, our chances of being able to reproduce the look at home are slim to none. I don't think the last couple of shorter haircuts I've had have been very flattering on me, so I decided I wanted to let my hair grow again. Not that I want it to be waist-length like it was in college (no kidding--I donated 12 inches to Locks of Love and still had hair well past my shoulders), but at least past chin/brushing-the-shoulders length. So I went to the salon because I hadn't had it cut since October. I know. I don't like to go because I never like my haircut! I was thinking just the minimum off the ends, maybe a little bit of long layering so I can flip it out or curl it a little if I feel like it. I ended up with TONS of layers, from my shoulders all the way up to my ears. Argh. The stylist flipped it all out, and it didn't look hideous, but it was way too frou-frou for me...I don't have the patience to fuss with it like that, and it just wasn't what I had in mind. And then, how do you handle it with the stylist? I usually just pretend I like it. I did mention that the layers were shorter than I had wanted but the stylist clearly felt bad, so I just was all, smiling, "Oh, it's fine! Not a problem. My hair grows pretty fast anyway." And do you tip if you really don't like the haircut? I did because I felt bad, but that seems a little odd. This morning was the first time I've made brownies since getting pregnant. Not getting to lick the bowl and spatula...just about killed me. Chocolate chip cookie dough is bad enough, but brownie batter? Don't think I won't remind this child every chance I get of the sacrifices Mama made for him or her. ETA: ...And the brownies themselves aren't even very good. They got baked too long so they're not even gooey. Blah! Steve and I had the most fabulous dinner tonight. And the best part is, it was completely easy and mostly leftovers (I'd made the dressing for Sunday's church potluck)! It was seriously so fantastic I couldn't even get over it...so I thought I'd post it here, in case anyone's looking for something easy, healthy and summery. Blend in blender or plastic shaker, adding oil last. We had it last night over spinach, grilled chicken (leftover), sliced strawberries, sweet onion, and candied pecans (you can candy them yourself--get a pan really hot, pour some sugar in and let it melt, and then dump in pecans and shake and toss them around). The original recipe calls for mandarin oranges instead of the berries, plain nuts of any kind, and croutons. It got rave reviews on Sunday. But yesterday's supper salads tasted like something you'd eat at a restaurant. They were soooooooo good. I want another one today! On Saturday afternoon I received an especially fun surprise of a phone call--my dear friend Jaala from college, telling me that she had made last-minute plans to come to Nashville! Her grandmother was speaking in the area and Jaala ended up riding down with her, so she had all day Monday free--to spend time with me! I met her at Opryland and we enjoyed lunch at the Rainforest Cafe, then did a little bit of shopping, toured the hotel, and finished off with some yummy ice cream. It was so wonderful to spend a leisurely afternoon catching up with her! Yay for the glorious surprise of unexpected visits from old friends.